LOS ANGELES--(BUSINESS WIRE)--Mondicon has announced it will unveil its new technology on Jan. 9 at the consumer electronics conference, CES, in Las Vegas, NV. Attendees can find the demonstration in the Holland Pavilion at Eureka Park during CES. Frequent travelers can save even more over their current data roaming charges by purchasing We.Stream’s unlimited data plan for $249 per year. The unlimited plan provides users with 2GB of high-speed internet (up to 150Mbps) on a monthly basis. After surpassing 2GBs, the speed is reduced, but the adjusted speed is ample for email and text purposes. This technology is all encased in a smartphone-sized device. Also included: a battery which allows the device to stay juiced for up to 15 hours and it can even be used as a USB-powerbank. We.Stream includes a built-in security layer, which is robust enough to support direct peer-to-peer VPN tunnels. This way, companies can let their employees connect securely to the corporate network and the internet. With the Cloud VPN option, individuals can conduct sensitive business online with peace of mind, knowing their data is secure and private. 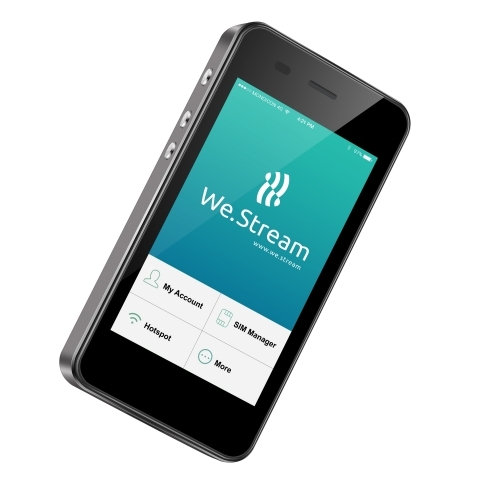 Attendees at CES can purchase We.Stream directly from the booth, the device can also be purchased via www.we.stream. We.Stream is actively looking for U.S. based distributors and resellers. The company behind We.Stream is Mondicon, a Dutch company specializing in mobile data solutions. The company will open their U.S. office in Santa Monica, CA, next week. We.Stream has been nominated for numerous technology awards and received the Inspirience Award 2017 for “Best Mobile Project”.